DIY Holiday Pinecone Garland Tutorial…and it took everything I had to include the word “holiday” in that title! I know it’s way too early for that but I’m trying very hard to think ahead…so I’m sharing a project that you can do now and it will last through Christmas. I wanted to make this garland last year…but it just didn’t happen. I was determined to give it a try for this holiday season and I must admit that it has turned out way better than I expected. I may have made one tiny mistake that I’ll tell you about later. First about the pinecones…if you actually collect your pinecones from the ground, you will have to make sure that there are no critters living in them. There are two ways to go about this. The first option is to bake them in the oven. Spread the pinecones out on large cookie sheets covered with foil and bake at 225 degrees for about 30 minutes. That will definitely kill any bugs in the pinecones. The second option is to put your pinecones in plastic bags…either large ziploc bags or small garbage bags with a twist tie. Throw the bags in your freezer for a day or two and all the bugs will die. Either of these methods works well. It’s easy to buy pinecones if you don’t have access to any or just don’t want to go collecting. Craft and discount stores carry them every holiday season. Last year I even saw them at my grocery store. I’ll also leave a link or two at the end to online sources. 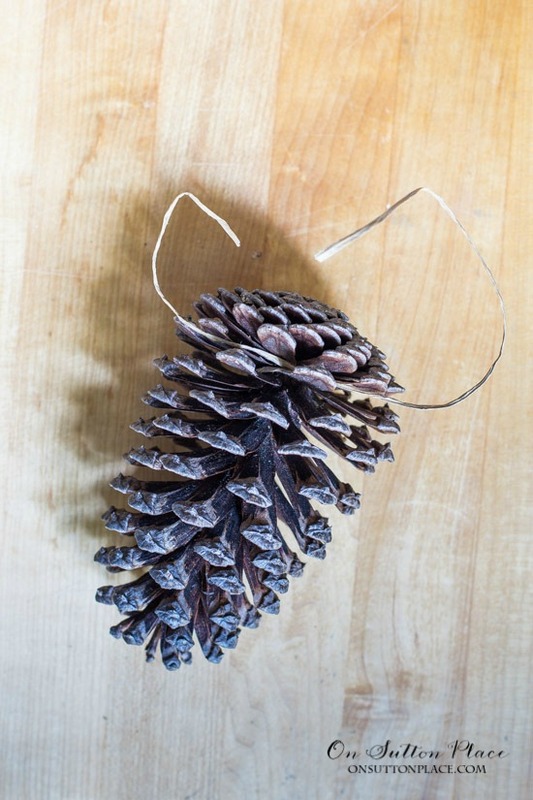 Now that your pinecones are critter-free, it’s time to make your garland. Pinecones – it’s hard to say how many due to length of garland and size of pinecones. I can guarantee that you will need more than you think! The natural oasis bind wire is amazing stuff. I have never used it before, but it’s perfect for this project. It’s wire covered with some sort of paper product so it looks like twine. The covering doesn’t tear and you can attach it just like a twisty tie. 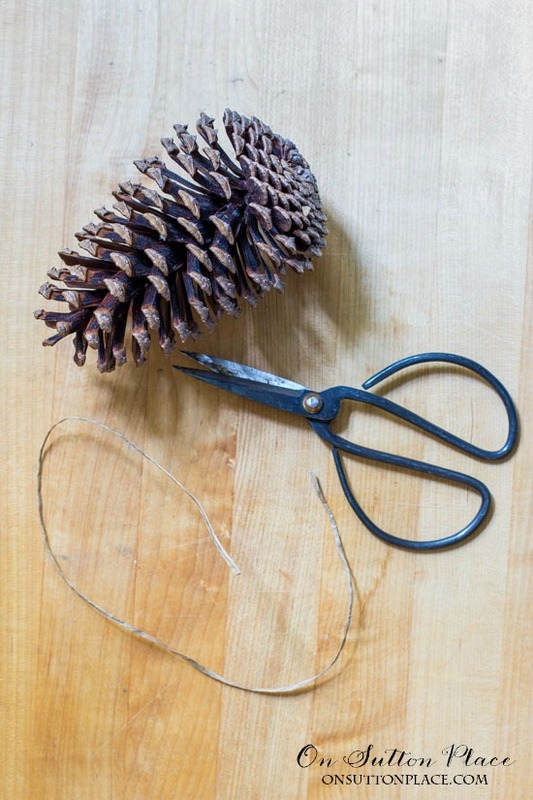 To begin, cut lengths of the oasis wire long enough to wrap around the large end of the pinecones, with generous tails. I used the assembly line method to make this garland. So once I cut all my wire pieces, I wrapped them around the pinecones and gave the wire a good twist. When you have most of your pinecones wrapped with the oasis wire, it’s time to figure out the garland length. Mine is hung around my front door, so I needed a piece of heavy twine about 12 feet long. I added a couple of feet just in case. If you want to hang one on a mantel, just measure the mantel length and add a few feet. 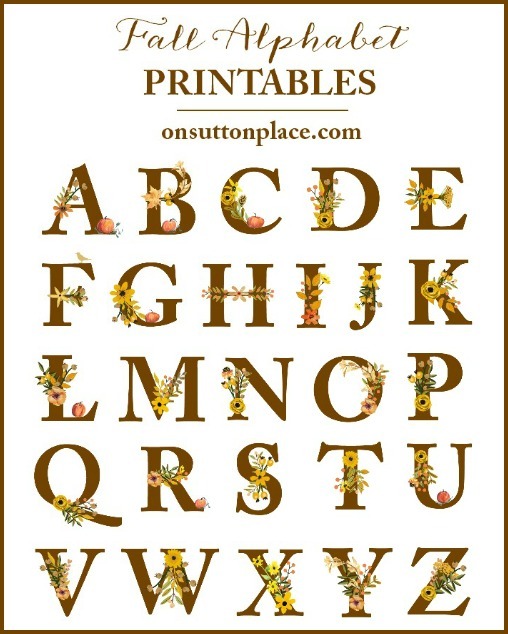 This garland would look lovely on a staircase or around a window too. Once you have your heavy twine cut to length, attach it to whatever base you are using. I pounded in a few nails to the casing around my front door and just tied the twine around the nails. I think Command Hooks would work well too. Now all that’s left to do is attach the pinecones to the heavy twine. To do that just twist the oasis wire around the twine. Trim the tails if needed. 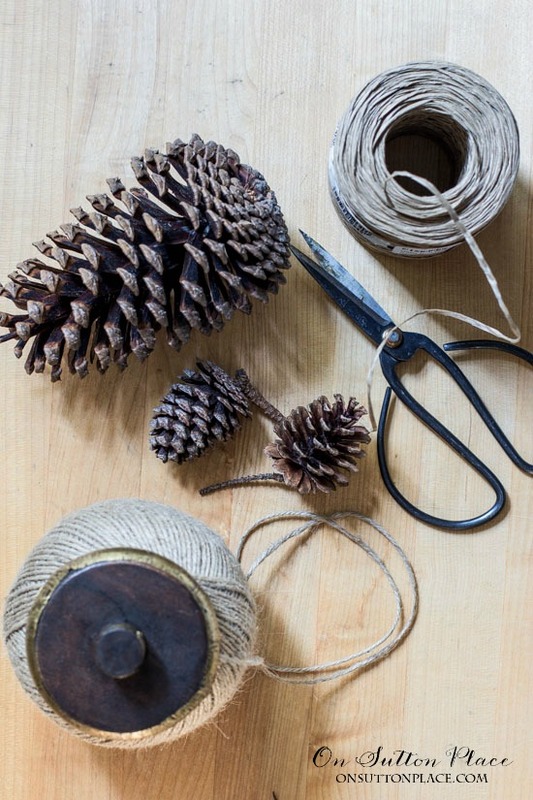 About the ends…you will need to knot a pinecone to the end of your twine so the pinecones don’t slip off. Just tie a loose slip knot, stick the oasis wire through the knot, tighten the knot, and then twist your oasis wire. I tried to use bigger pine cones at the ends of my garland to add a little weight. I mentioned a possible mistake earlier in the post, so here’s the scoop on that. I didn’t have any really heavy twine so I used regular twine from the craft store. I think it will be strong enough to hold the pinecones, but there’s always a chance it will break. Time will tell on that! I highly recommend using a sturdy, thick twine. UPDATE: After I had the pinecones attached to the twine coming down both sides of the door, I decided to make the top section a separate piece of twine. I cut another generous length of twine and attached it, along the top of the door, to the same nails holding up the side garlands. I stood on a stool and then attached all the pinecones to the twine on top of the door. See a pic of the finished garland below. You could also make this in three sections…which is probably the easiest method. One down the left side, one across the top and one down the right side. Again, if you are making the garland for a mantel or along the top of a window, one piece of twine would be perfect. Clearly there is no right or wrong way to do this! This project was fun and it actually didn’t take as long as I expected, even though my garland was really long. 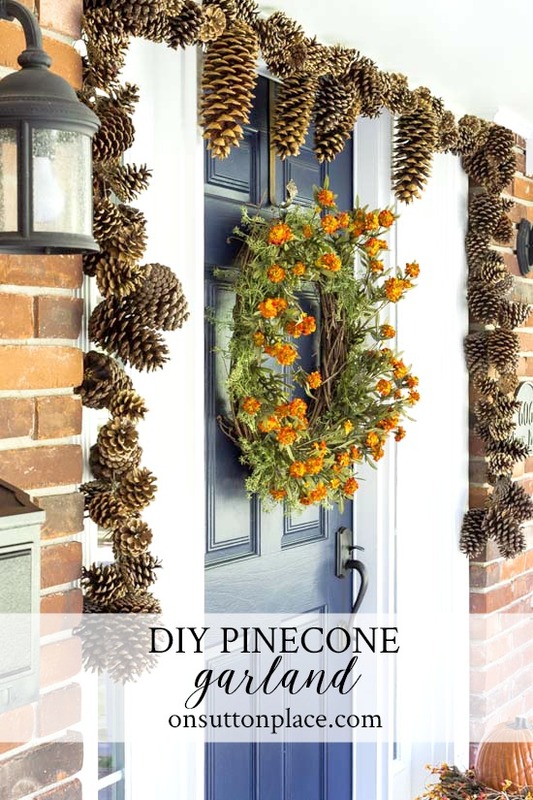 It was fun to see the pinecone garland take shape and I love the way it looks around our door. I’ll carefully store it in a plastic bin so it should last for several years. 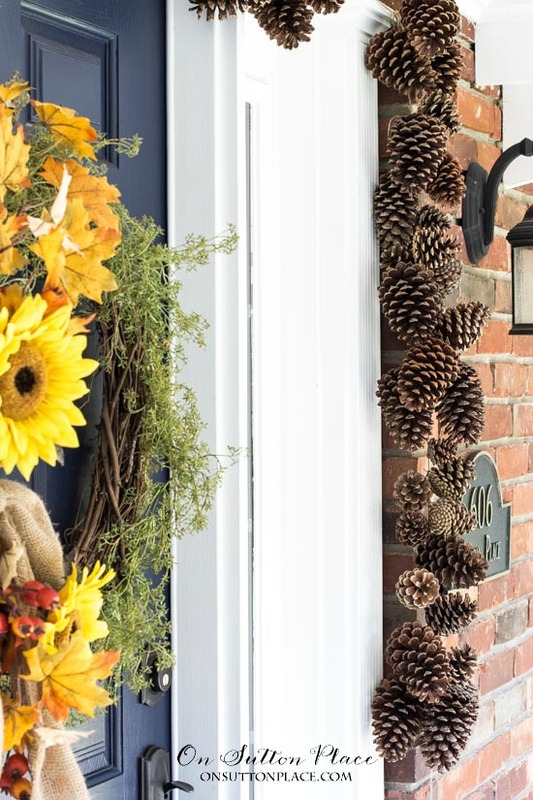 Click to see more of this fall front porch! 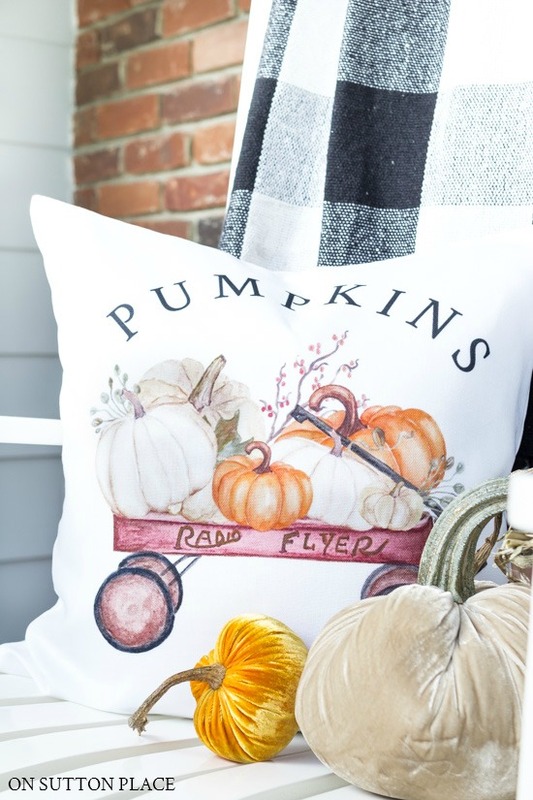 Shop Fall/Halloween/Thanksgiving designs at Sutton Place Designs! Ann, I just LOVED this idea! I bought a couple of those bags of scented pinecones at the grocery yesterday and spent the afternoon copying your idea today. I have French doors leading off the back porch into the kitchen and I have a garland going across the top now. I really like the wire you suggested and I even used it instead of twine as my base. Thanks for the beautiful idea! Ann, I did this project as a demo for my Garden Club tonight. 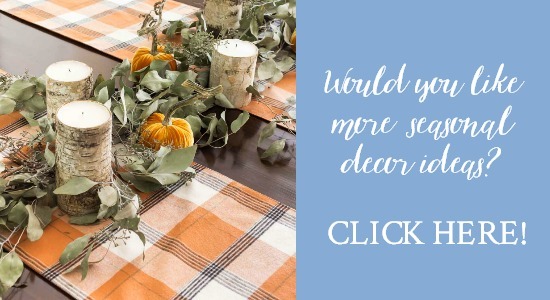 All of the members were very excited about the project and were thinking of different variations they could do, including a fall version where you would intertwine a fall leaf garland in with the pine cones. Thanks for the inspiration! I am sending all of them (15 people) a link to your blog. Great project! I love crafts and home decor that use natural items and I have plenty of pine cones! I probably wouldn’t have thought to prepare the pine cones, so thanks for that tip. Such a simple but adorable holiday project! This would look so much better around my front door instead of garland! I’ve always wanted to make a pine cone garland. After reading your tutorial and discovering Oasis Bind Wire, I’m going to try this. 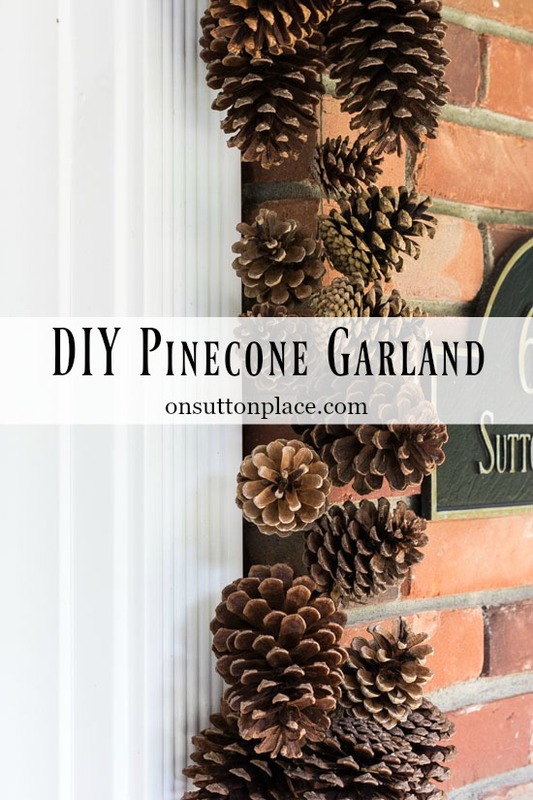 Ann, your tutorial for the pinecone garland is terrific and I CAN DO IT! I have found tutorials for pinecone garlands in the past that were SO confusing, I simply gave up! I have four different types of pinecones from trees in our side lot and every year, I tell whoever comes by to take how much they want of whatever they want and even with that, I always have pinecones galore. One tree produces some nice large, very pretty shaped pinecones, that will make a great long garland, exactly what I’ve been wanting! Thanks! I don’t decorate for holidays. ..but I do enjoy pinecones and fall decor. Thank you! Thank you for the pinecone garland instructions. Have pinecones in plastic bag in garage from last year. Didn’t know what to do with them…I do now! How fun, Ann. I’ve got to try this as soon as my twine comes. You always have the best ideas. Love the pine cone garland It will be fun to make. The wreath is lovely. Your wreath ideas are great and I have made several of them. Thank you so much for sharing. I love it Ann, I’m going to try it, I already have a bunch of pine cones that I baked last year, thanks for the great idea!! I have been collecting pine cones all summer! I have a garden cart full, a 5 gallon bucket full, and a window box full of them. I see a garland in my future! Love pine cones, thank you. It’s a totally new idea. I hadn’t seen it anywhere. This is a great idea if you have a huge basket of them and i do, thanks Ann. Can’t wait to trying it! Thank you! So lovely. And thank you for the tip. Thanks again, Ann, for sharing another project that looks elegant but is not too difficult to do. This garland would look great on our fireplace mantle so I hope to get busy and get it done for the holidays. Looking forward to seeing your entire door! Blessings as you continue to be a blessing to all of us. Thank you so much for the great garland idea. Also thanks for the EARLY heads up. Many times I see great ideas but…….it’s just way to late for crafts around the holidays. I enjoy your blog. Where do you buy natural oasis bind wire??? Heavy twine??? Does anyone have an EASY way to bleach pinecones w/o turning it into a big mess??? I’ve always wanted bleached pinecones. I live in NC and pinecones are Everywhere! Hi Charley! I included links to all the supplies needed in the post. As far as bleaching pinecones, I have never done it. There is a comment on this post by one of my readers and she shared her process. Good luck! Ann, I love this garland! It’s now on my must-make list!!! Beautiful! Hi, Yvonne, I live in Cary, NC and yes pinecones are everywhere. I bleached a patch two years ago and plan to do another patch soon. I would like to make this garland with bleached pinecones for my mantle. I found that investing in a big painters pail. ( You can get them in Home Depot or Lowes) is worth the $$$. I first tried a smaller pail and it did not hold that many pinecones. Second get a round piece of wood that fits inside the diameter of your bucket. I had one already that was for a table top. I covered it with heavy duty foil so it would not get messed up by the bleach water. I use a 50/50 ratio of regular bleach to water. I put the pinecones in my big bucket, covered them half with the bleach/ water mixture and but in my circle. Then I weighed the circle down with bricks. You may have to play with the amount of bleach/ water mixture. You want to cover the pinecones, but not over flow your bucket. I did this outside under my deck when not rain was in the forecast. I let them sit for two days, then rinsed them well and let them dry in the sun for several days. They turned out great. I was trying to post a photo. You can tell I am not a blogger. I also live in Cary, NC! We should get together to do crafts! Is the round piece so the bucket doesn’t deteriorate or what? I love the bleached pinecone casual, beach effect. Hi Charley, The round piece is to put on top and weigh the pinecones down. They float and don’t bleach evenly if you don’t weigh them down. Would love to meet and share so crafting ideas. You can find me on Facebook. 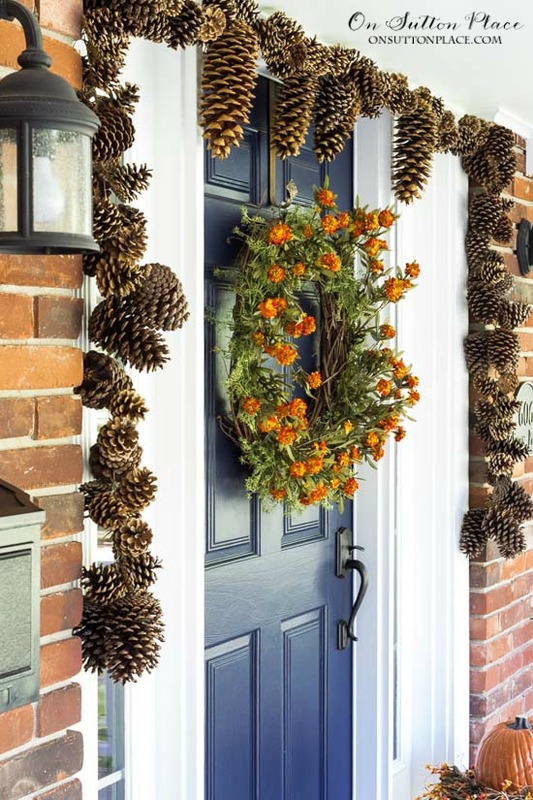 Your front door looks wonderful with the pine cone garland. Thank you for the excellent instructions and photos! Looking forward to your next decorating step. I love it. Not too early. Some projects take time gathering the items and finishing it. Thanks. I love it! We have tons of pinecones that we have to pick up each year and I have some glittered pines that I bought on clearance that I will mix in just for fun! Excited to try this project. Thanks! Hmmm… I thought those garlands would be difficult to make; thank you for showing that they are not! As far as being too early with a “holiday” idea, I appreciate that you posted it now because it gives us time to prepare and get it made for the holidays When the holiday season is upon us there is little to no time for crafting – at least for me. I appreciate you early post. Thank you. ???? I love it! I do have a supply of pine cones, so this project will soon be on the burner. Thanks! I’ve seen something similar before but the instructions weren’t as easy/clear as yours are. Thanks for the great idea! This is a great idea and since I have a large pail of pinecones I’m going to try to make one. Thanks so much for sharing. What a cute idea, Ann! Something different for my porch doors this Christmas. I may purchase the cinnamon Pinecones and add some embellishments too. Thanks for the DIY. Can’t wait to see your Garland completed! I love it! Thank you so much for this. I have been trying to make one for my Christmas tree for the past two years. Ever since I saw one at the Christmas store that was highly over priced. My attempts have been total fails. This one looks perfect!